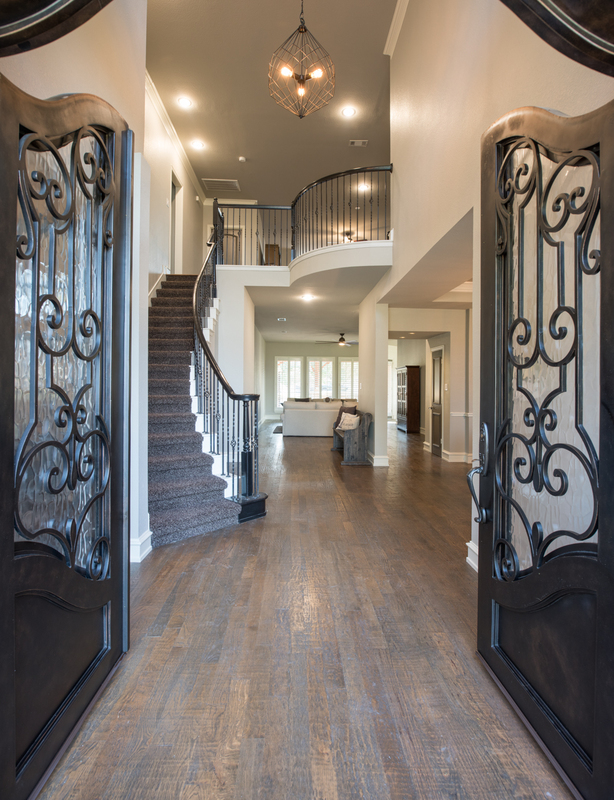 Matlock Real Estate Group is excited to offer this gorgeous custom 6,063 sq. 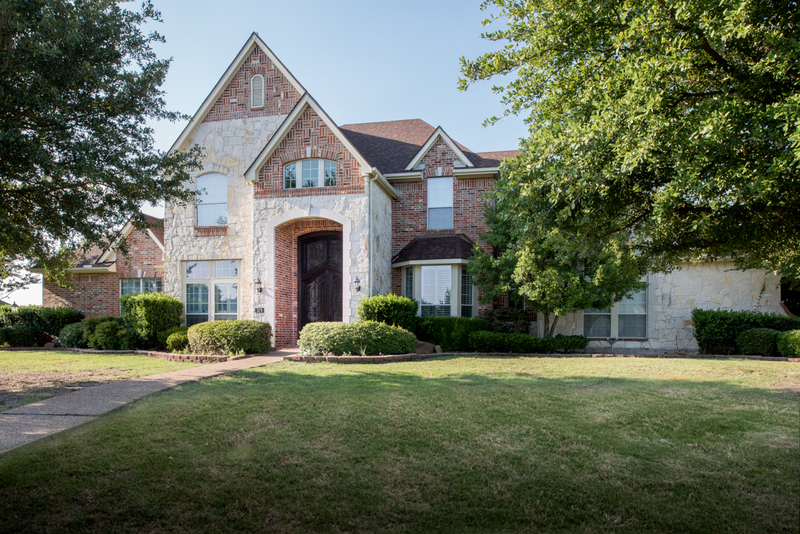 ft. estate home set on a 1.5 acreage property in the beautiful, family friendly Estates at Austin Trail community within Lovejoy ISD boundaries. 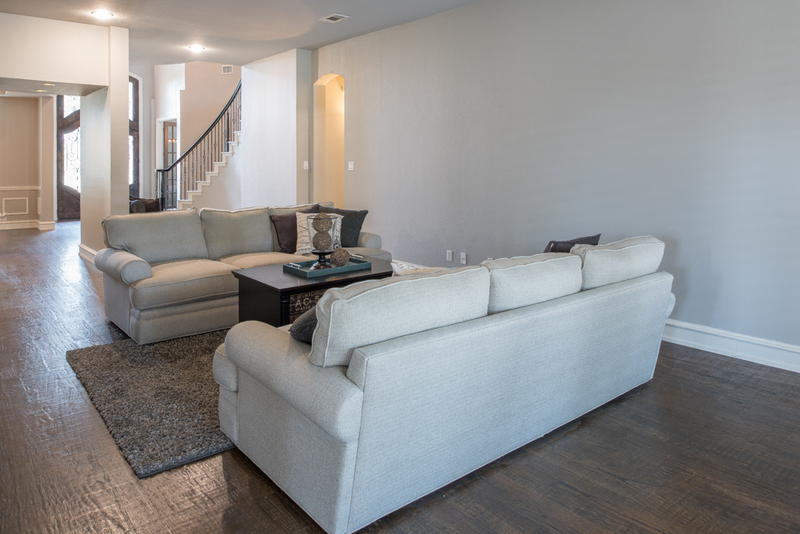 The residence offers a very comfortable, open floor plan with spacious, connected living and dining areas – perfect for everyday family living and casual entertaining. 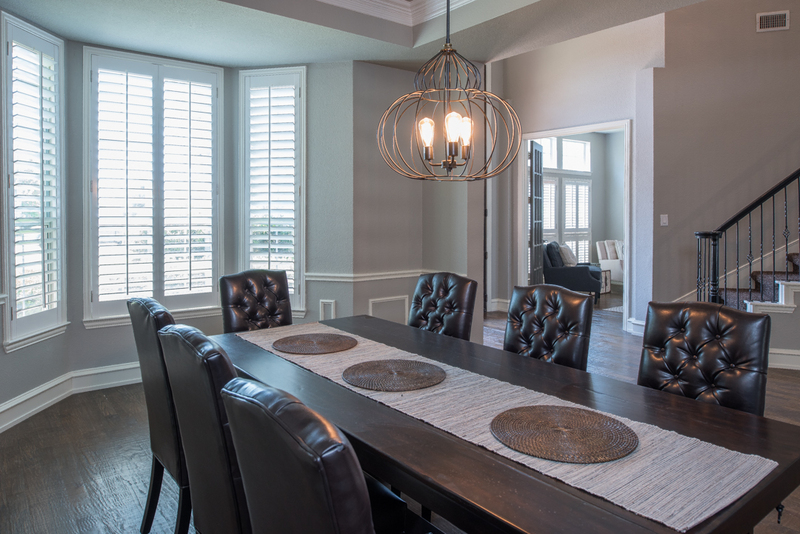 The meticulously remodeled interior extends effortlessly from room to room, with gleaming hardwood floors throughout, stylish millwork trim and details, and vaulted ceilings. 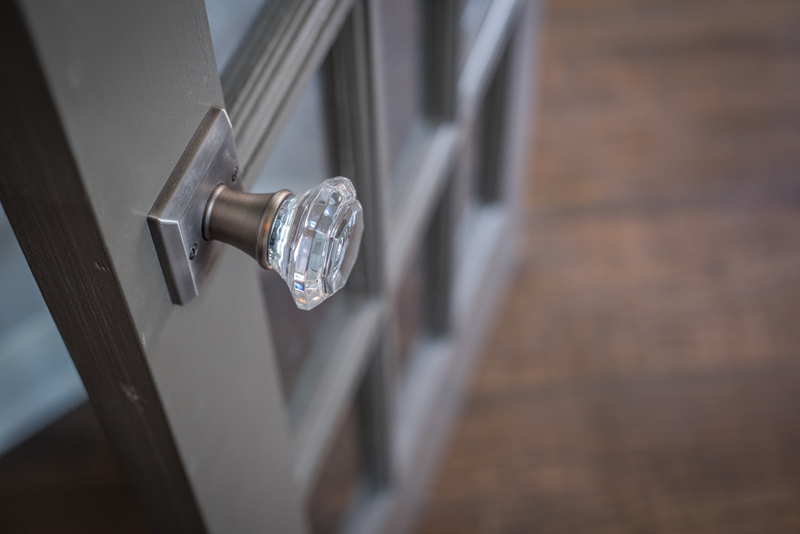 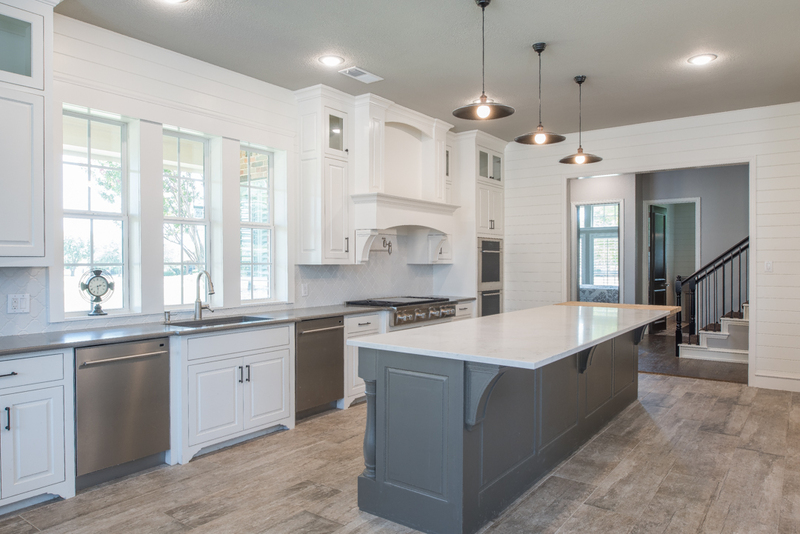 Superior designer finishes throughout include distinctive hardwood barn style doors, premium ceramic tile floors, on-trend ship-lap wall accents, designer chandeliers and lighting fixtures, along with beautiful coordinating hardwood cabinetry and built-in’s featuring quality details and hardware. 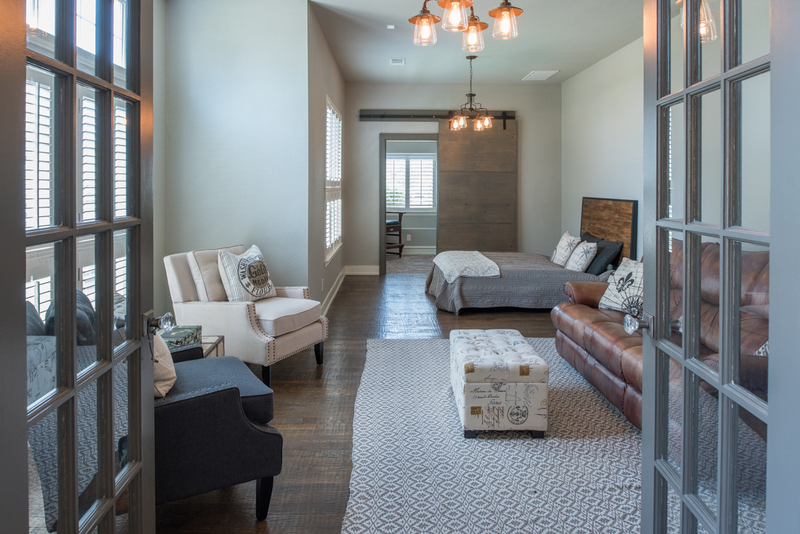 The welcoming Entry features a massive custom-made metal and glass double front door, lustrous hardwood floors, and a stylish designer lighting suspended from the towering ceiling. 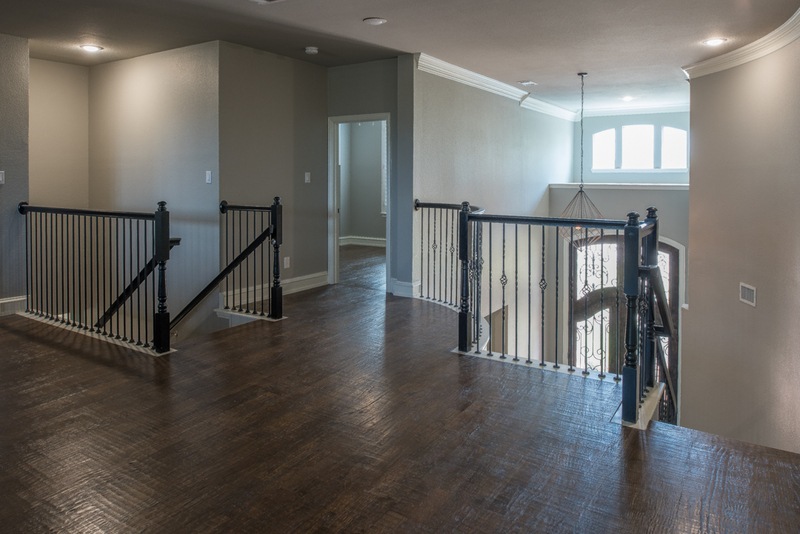 A graceful curved staircase draws the eye upward to the second-floor cat walk and balcony that overlooks the Entry below. 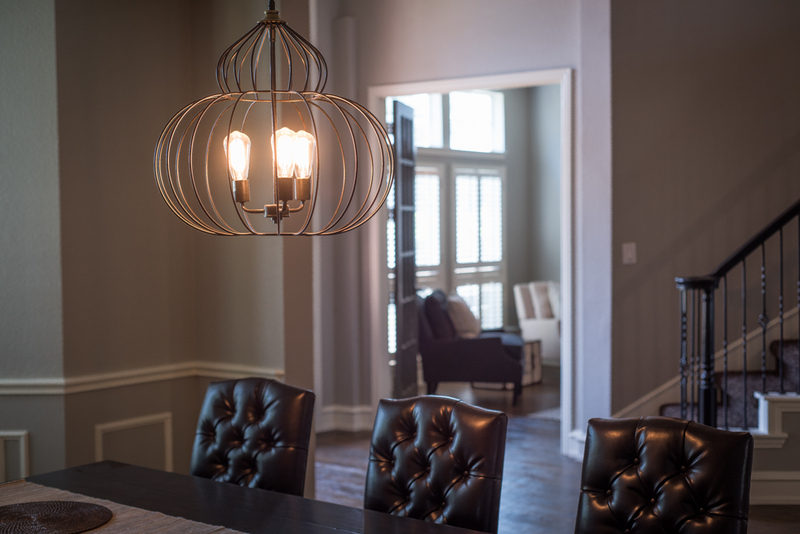 The adjoining elegant Formal Dining Room offers hardwood floors, on-trend wall paint accented with trim and moldings, and a distinctive chandelier suspended from the tray ceiling element. 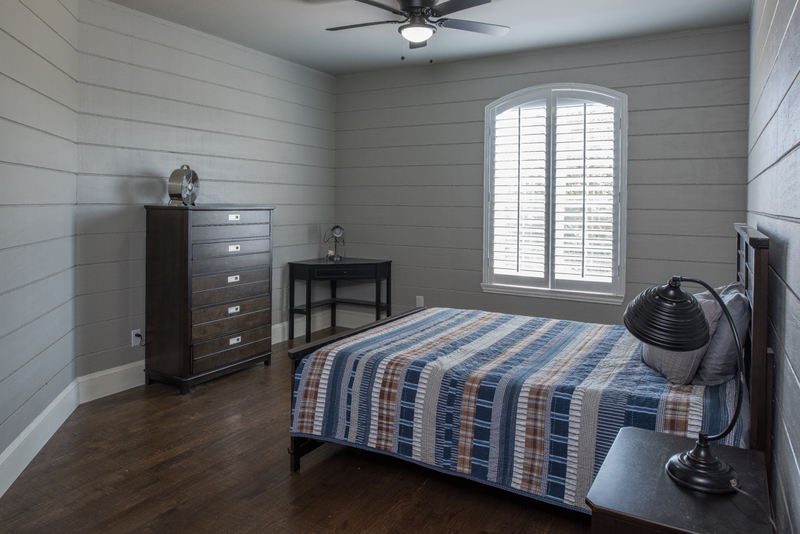 The oversized Guest Suite features hardwood floor, stylish light fixtures, and a wall of shuttered windows that overlook the front property. 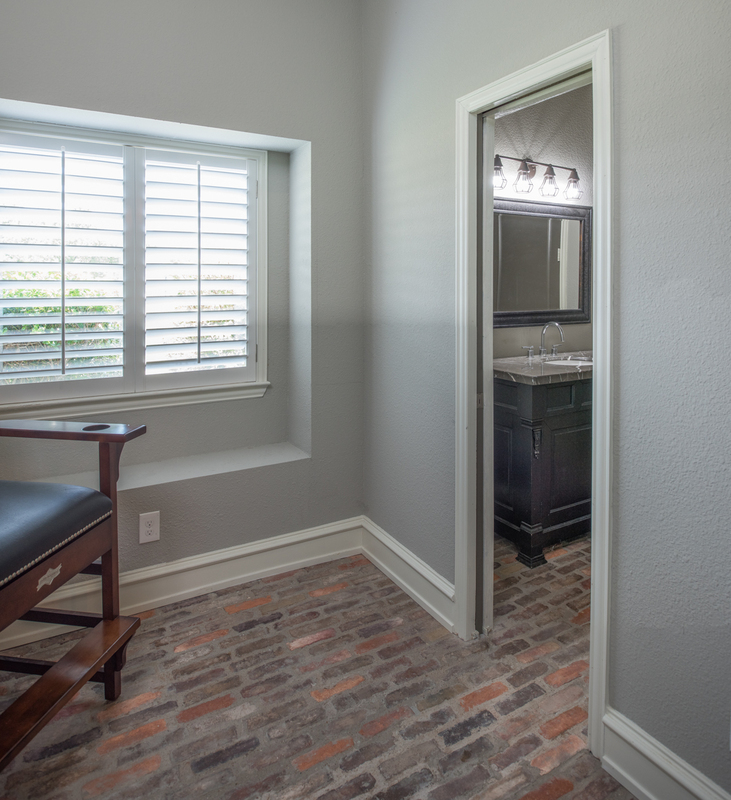 A custom barn door leads to a lobby for the full bath that features exposed brick floors and custom stone surfaced vanity with stylish hardware and fixtures, along with a large walk in closet. 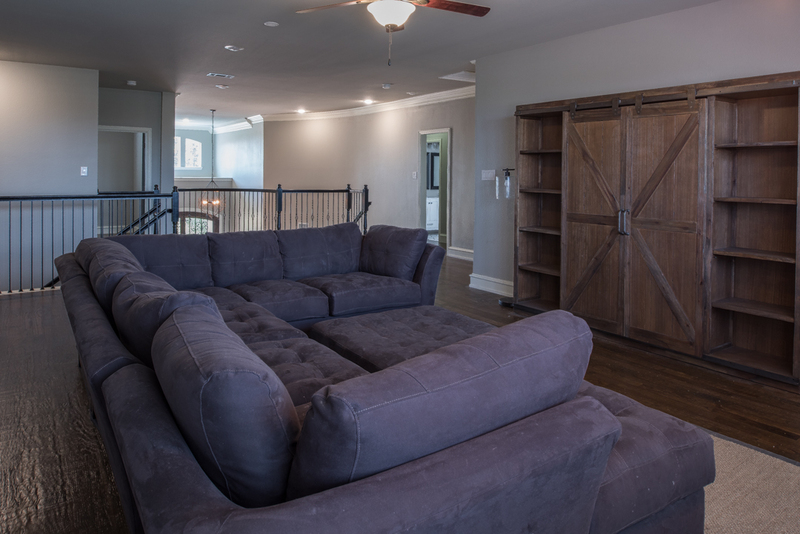 The spacious Great Room offers a wall of shuttered windows with views of the Outdoor Living Area and property while providing an abundance of natural light. 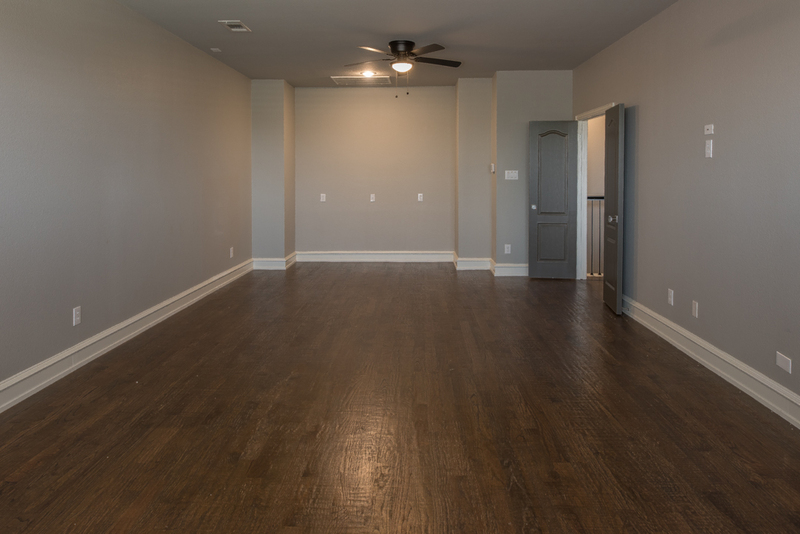 The open concept space adjoins the well-appointed Kitchen and Breakfast Nook and connects to main floor bedroom suites and functional rooms. 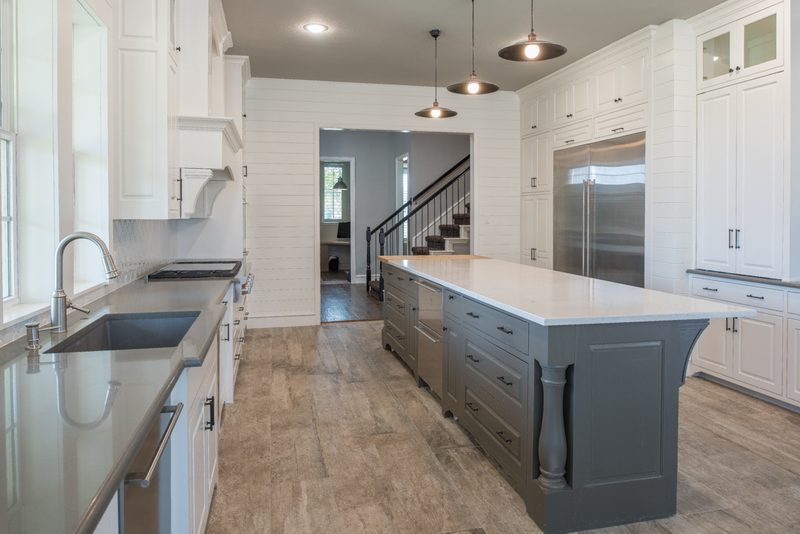 The spacious Kitchen offers premium flooring, ship-lap accented walls, and designer lighting fixtures. 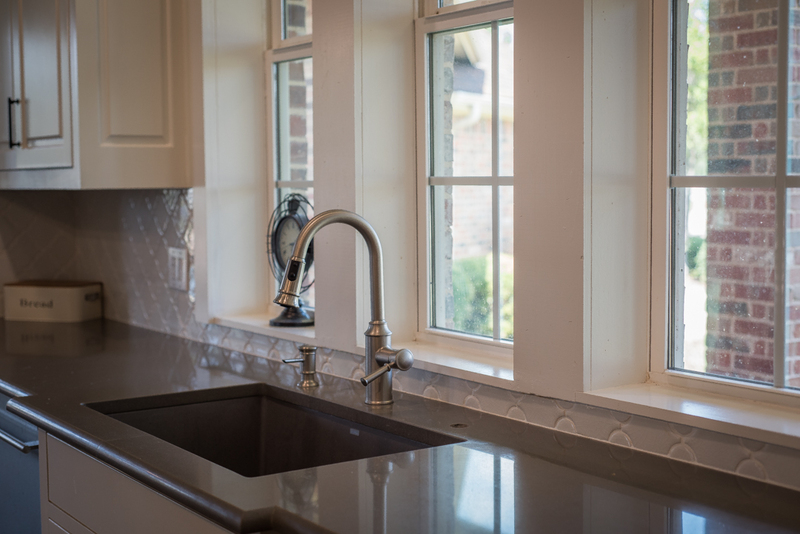 The well-appointed space features the finest custom cabinetry, premium stone counter tops and tile backsplashes, and the top-of-the-line appliance package with double ovens and dishwashers. 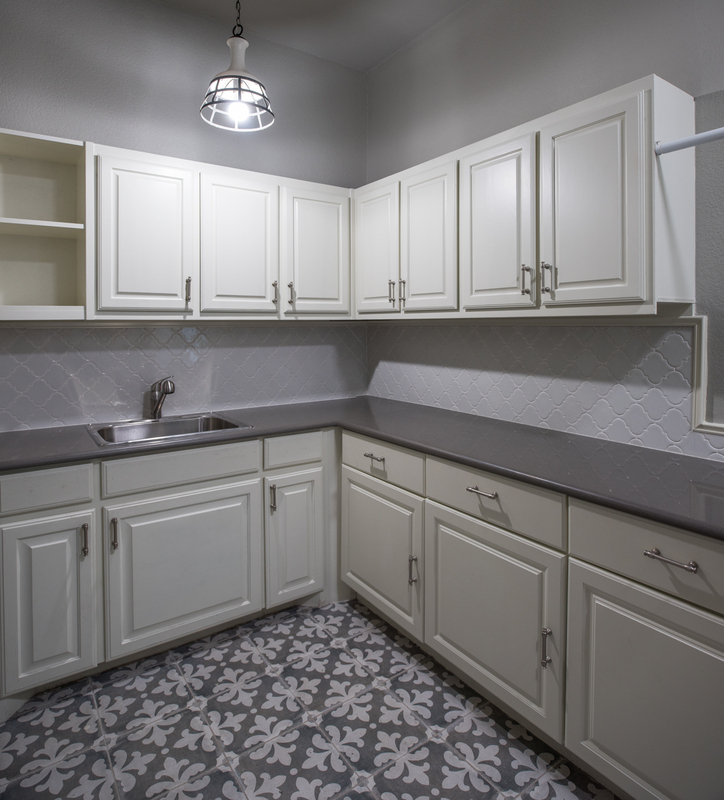 Also offered is a commercial size refrigerator/freezer and a professional gas cook top with pot filler faucet under a custom hood. 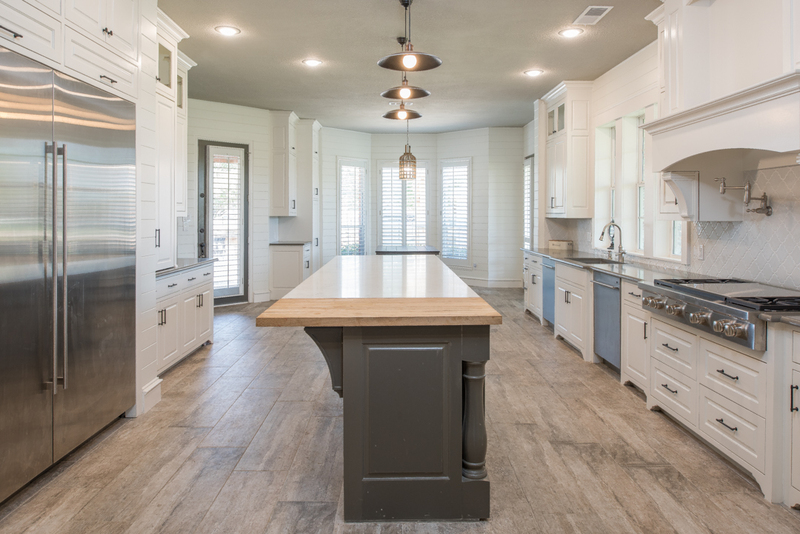 The large island with seating features a butcher-block surface at one end completing this functional space. 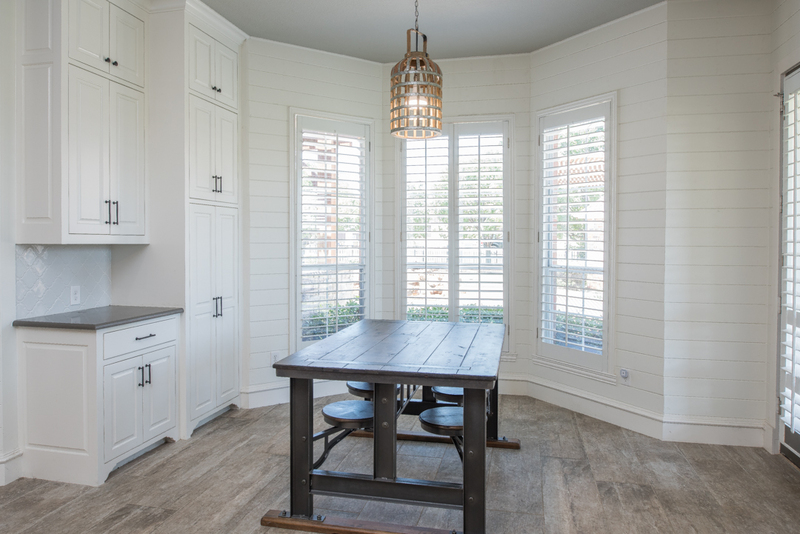 The charming Breakfast Nook features ship-lap walls and built-in cabinetry along with shuttered windows and door that leads to the covered walkway to the 4 Car Garage. 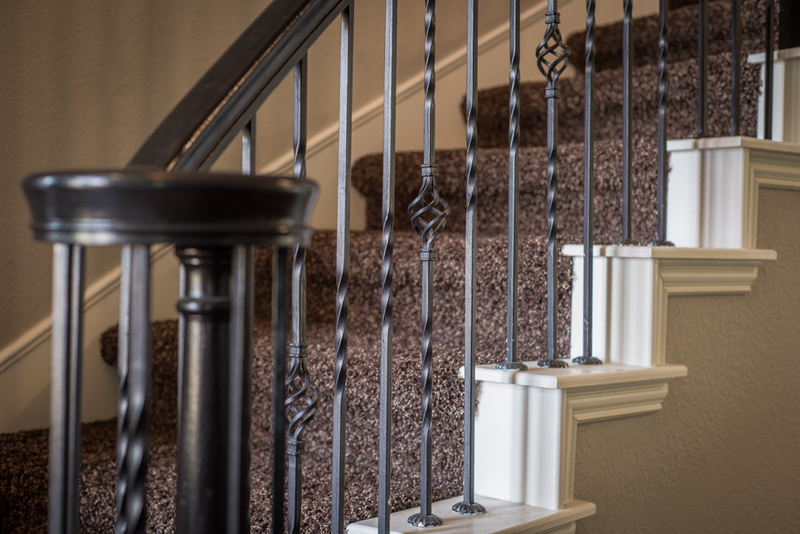 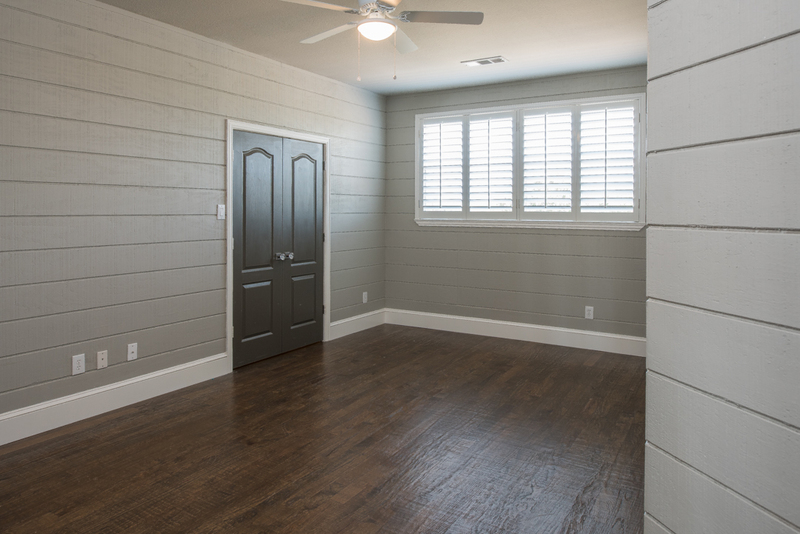 A service hallway connects to a handy Home Office with desk and storage, along with access to the Rear Staircase and Mud Room that has an exterior door to the covered walkway to the 4 Car Garage. 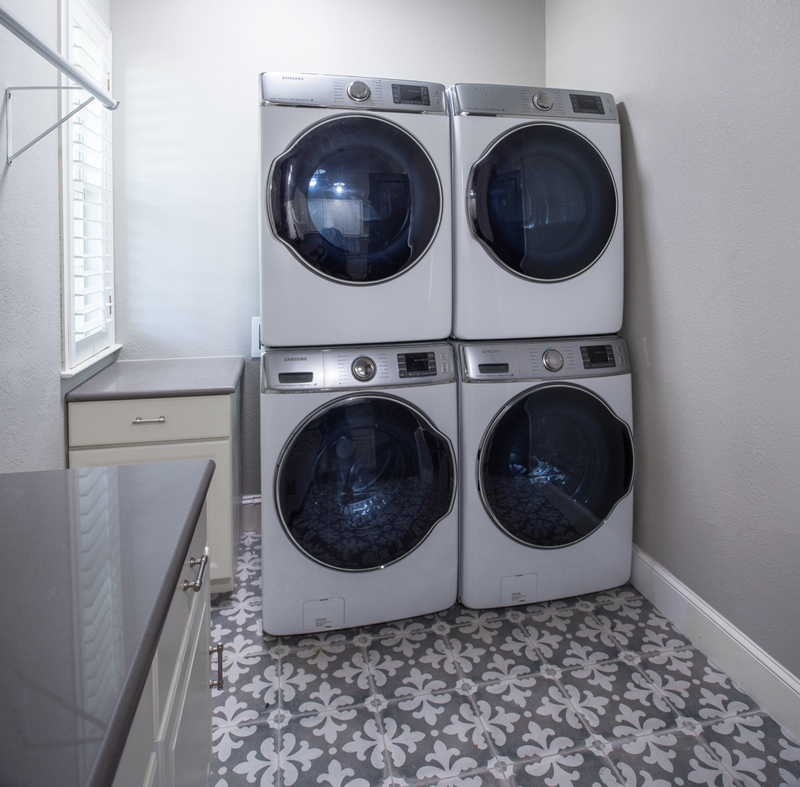 The Utility Room is strategically located off the Mud Room and has premium tile floors and custom storage cabinets with solid surface counter tops. 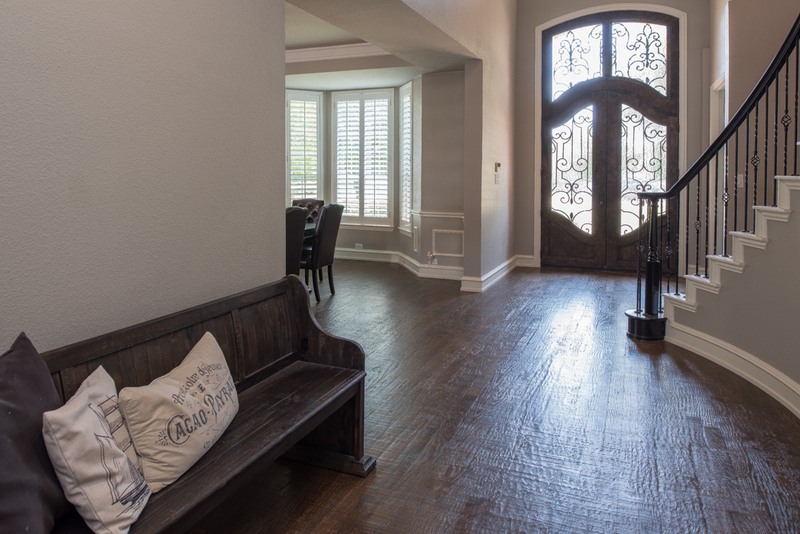 The private, oversized Owners Suite features beautiful hardwood floors and on-trend wall paint, and a windowed sitting area with views and access to the rear property. 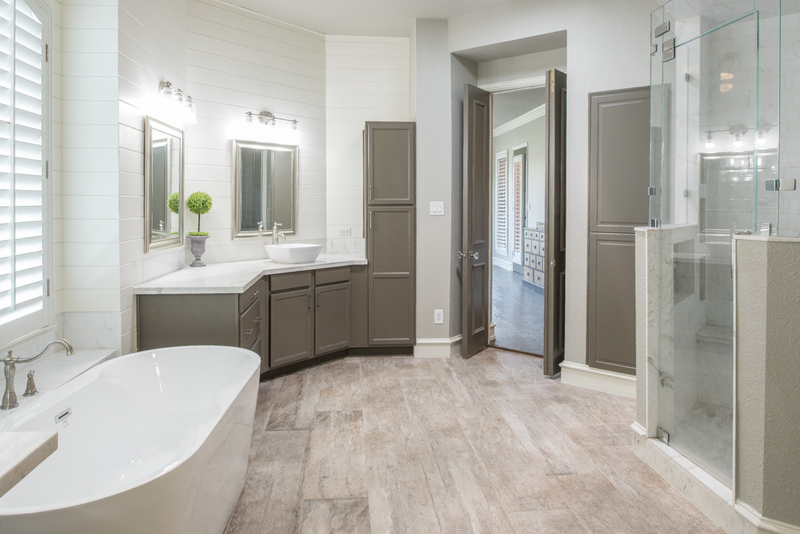 The spa-like en suite bathroom offers top-quality flooring and on-trend wall paint with ship-lap wall elements. 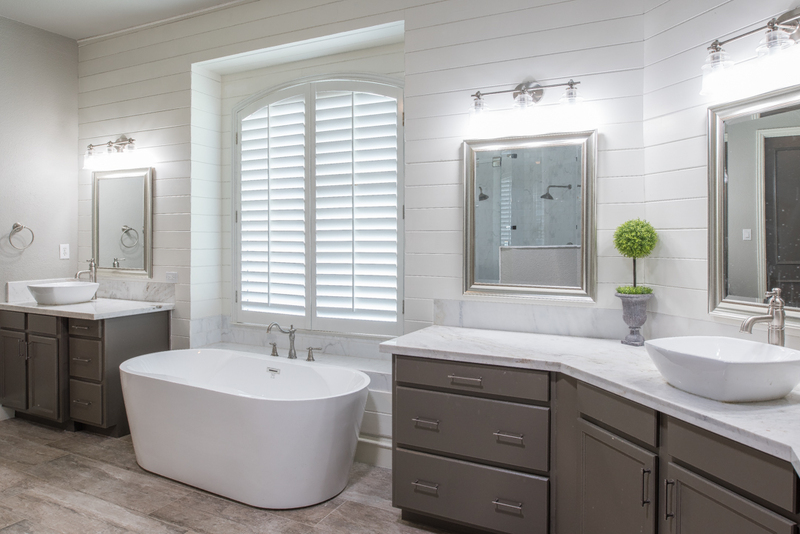 The separate vanities with stone surfaces and vessel sinks accented are with premium fixtures and lighting. 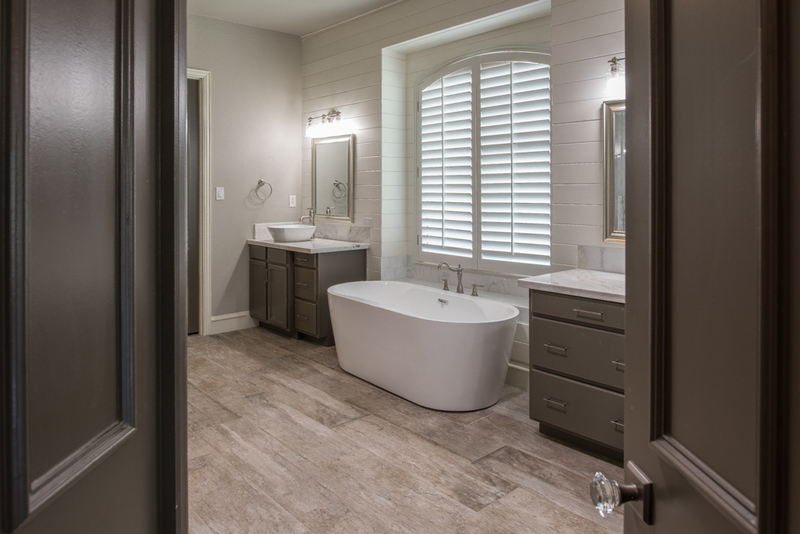 The large free-standing tub is positioned under a large shuttered window and the oversized walk-in shower features frameless glass enclose and dual shower heads. 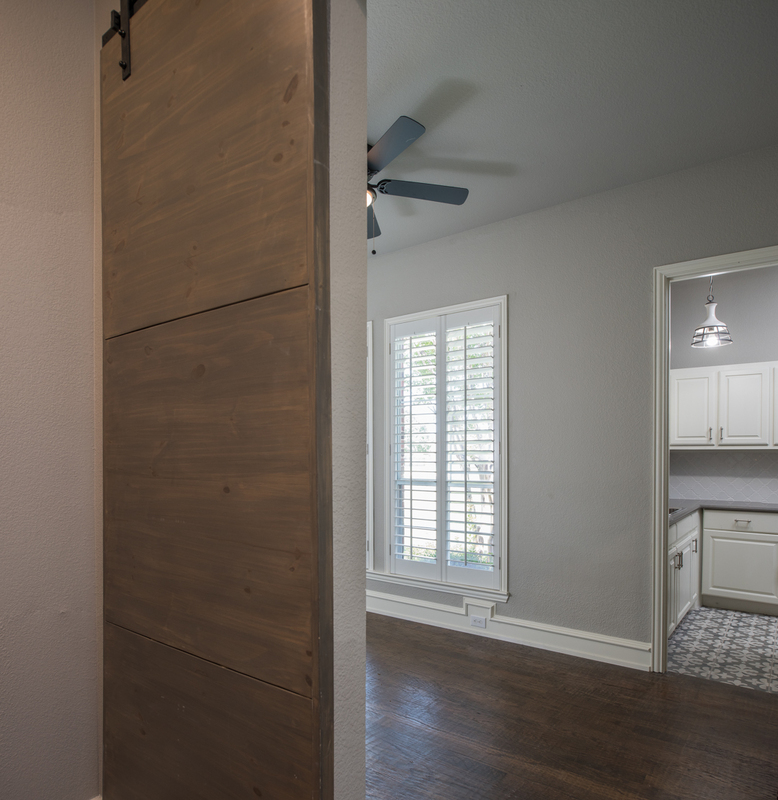 The large walk-in closet offers a recently installed custom built-in wardrobe storage. 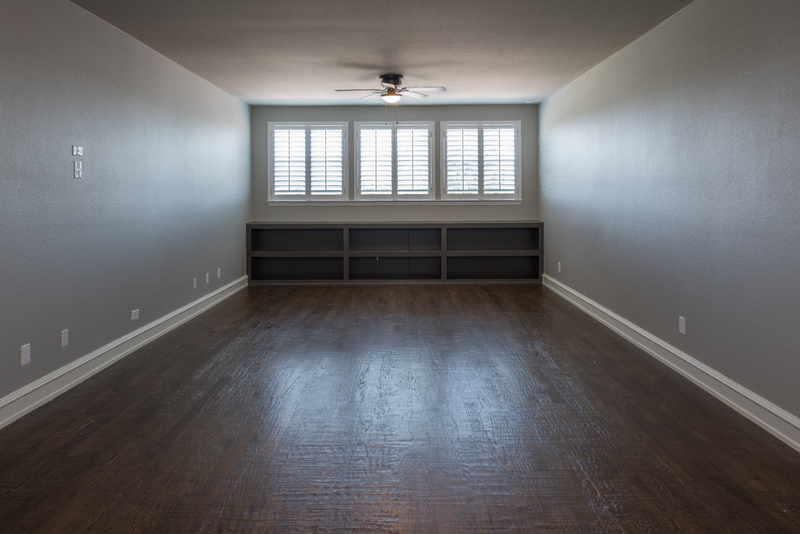 The second floor offers a spacious Loft living area and adjoining Gameroom/Media Room both with hardwood floors, on-trend wall paint, and shuttered windows overlooking the rear property below. 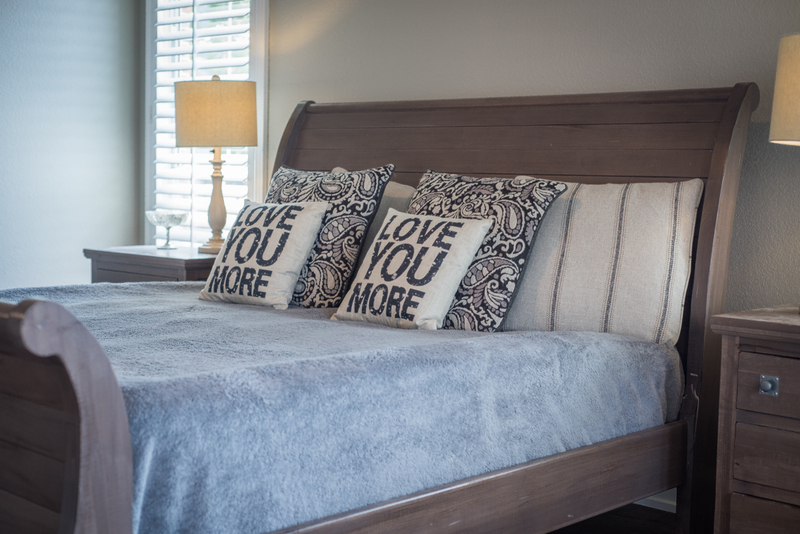 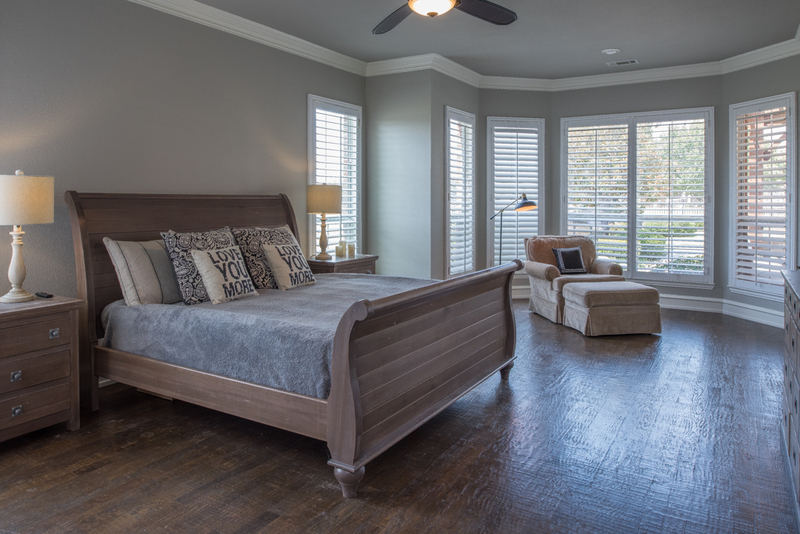 The Secondary Bedrooms offer hardwood floors, custom wall paint – some with ship-lap details and/or built-ins – all have walk-in closets and are adjacent to full bathrooms with quality upgrades. 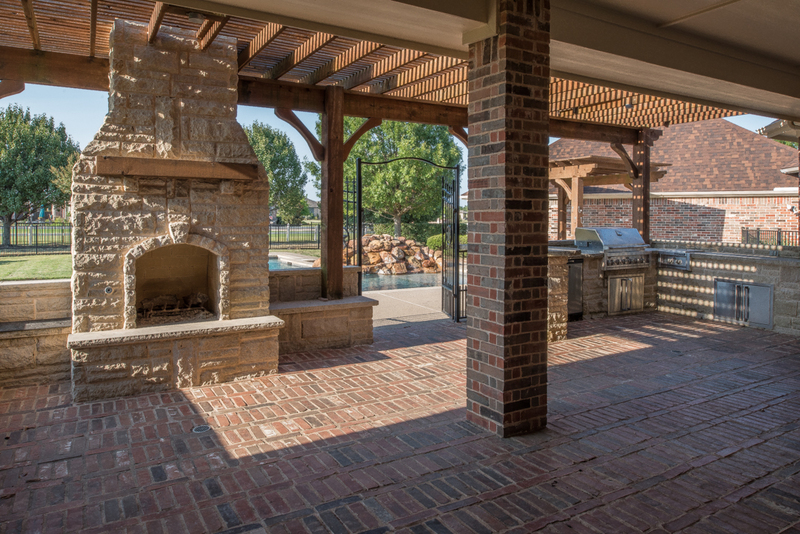 The residence features a large Outdoor Living Area with brick floor and custom Cedar Arbor. 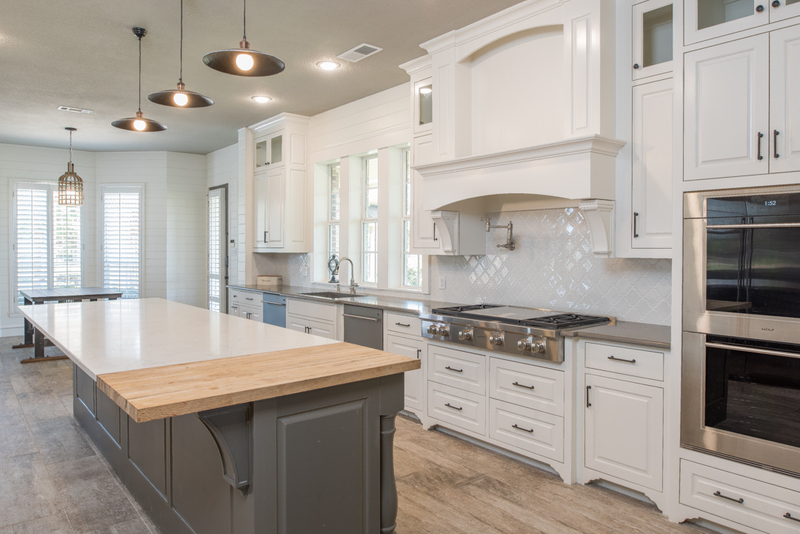 A massive stone fireplace with bench seating is the focal point of this entertaining space that also offers a stone cooking station with grill and an extended counter surface. 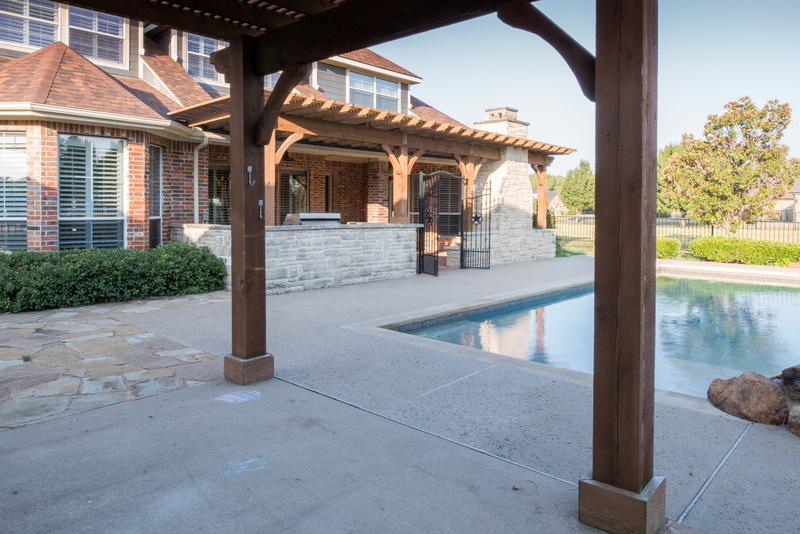 A custom metal gate separates the Outdoor Living Area from the pool and rear property. 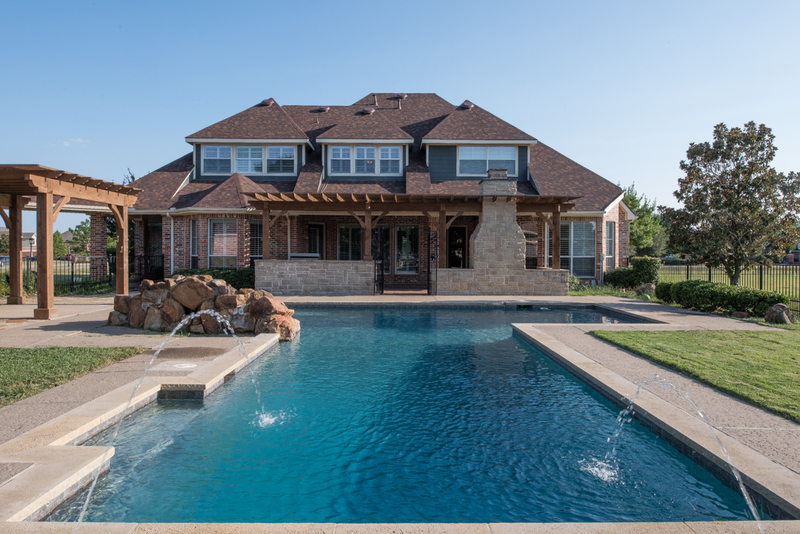 The oversized diving pool features a boulder water feature and an additional Cedar arbor is placed nearby. 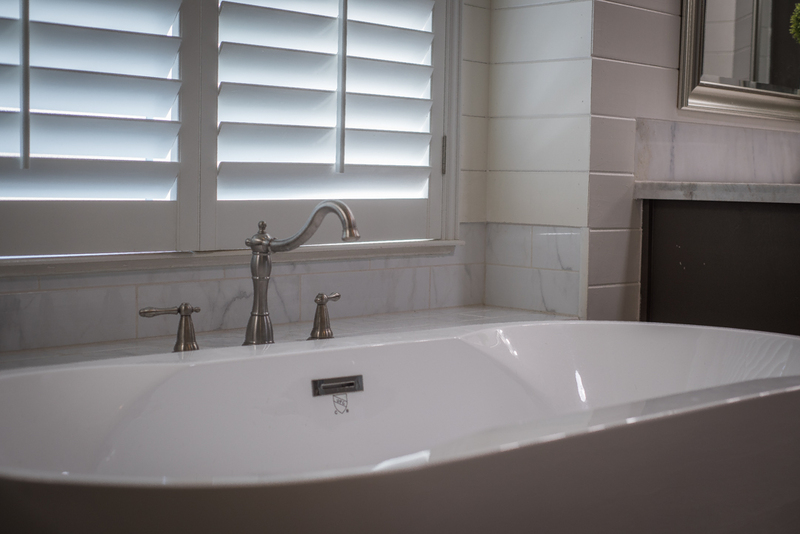 The pool area features professionally planned and maintained landscape beds and is encircled by metal fencing. 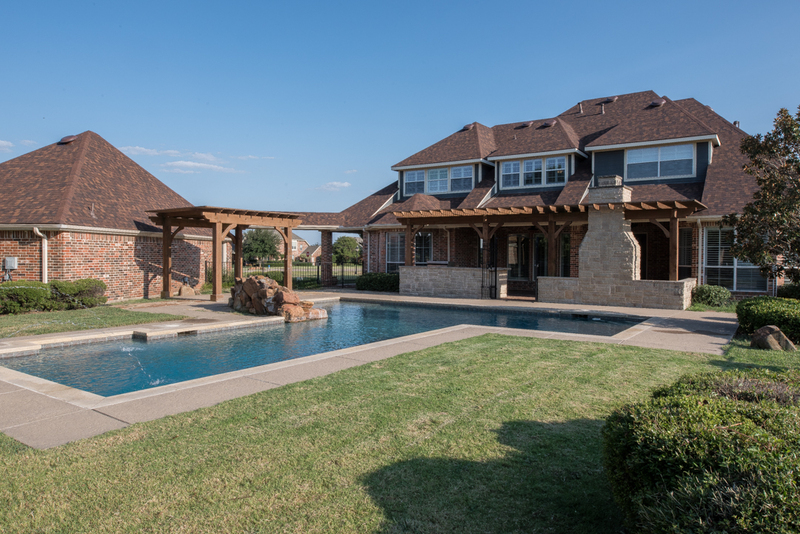 An expansive lawn area outside the pool fence also has metal fencing around the perimeter.